Organic Beef Broth, Organic Turkey Broth, Lamb Broth, Bison Broth, Organic Onion, Organic Carrots, Organic Celery, Organic Apple Cider Vinegar, Organic Garlic, Selina Brand Celtic Sea Salt, Organic Rosemary, Organic Thyme, Organic Parsley. Broth made with filtered water and from organic grassfed beef bones, organic turkey bones, grassfed lamb bones, and grassfed bison bones. Our friends at Bonafide Provisions have crafted another masterpiece! This time it's a blend that combines beef, bison, lamb and turkey bones for a rich, flavorful broth that is a must-have ingredient for your next master chef creation. 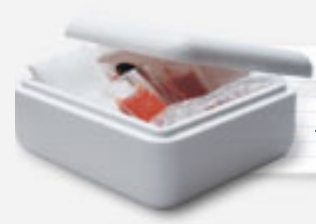 The sourcing for this broth actually reaches beyond the requirements of organic certification. Because the availability of organic lamb and bison bones is limited, they are not certified organic, however all of the lamb and bison bones come from 100% pasture raised animals and independently-owned small family farms. They are raised with minimal interference and they are never given antibiotics or hormones. They have full access to pasture for the entirety of their lives, and the farmers who raise them follow strict and stringent humane animal welfare practices. The beef and turkey bones are certified organic. Rich in cysteine, a congestion-fighting amino acid, our bone broth is more than a home remedy for colds and sniffles. This delicious and health-giving brew is loaded with readily bioavailable forms of calcium, magnesium, silicon, and sulfur, as well as trace minerals, glucosamine, and chondroitin sulphates. Each pouch of bone broth contains 24 fl oz (3 servings of 8 fl oz each). Organic Beef Broth, Organic Turkey Broth, Lamb Broth, Bison Broth, Organic Onion, Organic Carrots, Organic Celery, Organic Apple Cider Vinegar, Organic Garlic, Selina Brand Celtic Sea Salt, Organic Rosemary, Organic Thyme, Organic Parsley. 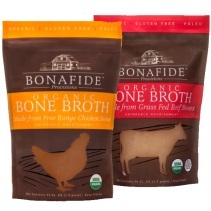 Broth made with filtered water and from organic beef bones, organic turkey bones, grassfed lamb bones, and grassfed bison bones.